After helping a site troubleshoot a problem that came up on one of their pc’s, I have a few tips for anyone who might be having similar problems or just wants to optimize their current installation. – Ol Monitor refreshes once and then becomes extremely sluggish, freezes, and has to be terminated with Task Manager. – Multiple Smarterm sessions with “KillMe” in the title bar. – Clicking on Ol Monitor application and getting “This program is not responding..” message. -Turn off Error Logging: This option is in the Misc tab under ‘Error Controls’. On the pc in question, this turned out to be consuming way too much time and causing timeouts and freezing. If you are having no issues with Ol Monitor you can safely turn off this option anyway. -Un-Check ‘Test Mode’: This option is also under ‘Error Controls’ and is only used when testing out Ol Monitor. If you have it enabled during normal use the Smarterm macro will prompt you at every refresh. If the Smarterm window is hidden or in the background this prompt will hang up the macro. 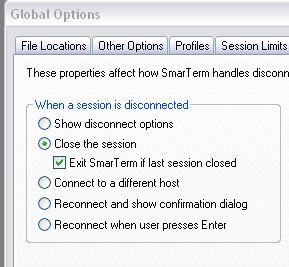 Note which option you have selected and then try selecting ‘Close the session’ and ‘Exit Smarterm if last session closed’. Although your server may have a timeout and disconnects Ol Monitor, Smarterm will still not close when a macro is running. The macro will try to reconnect if the session disconnects. The other options, ‘Show disconnect options’ in particular, may cause Smarterm to pop up a question box that prevents Ol Monitor from shutting it down. Finally, note that with version 1.54 of Ol Monitor 2 additional connection checks have been added to sections of the macro. Next: SSH upgrade effect on OLM monitor, or: The somewhat convoluted process of getting the SSH password to save. Previous: Is there a way to filter out a package of tests versus individual tests.